Light and crisp with aromas of tropical fruit. Green apple on the palate with a slight mineral finish complimented by just a touch of effervescence. Pairs very well with seafood. Recommendations: I’ll be the first to admit that I had never heard of the Jongieux grape before receiving this bottle, but then I don’t drink a lot of French wine. I was told to pair it with seafood, and so I had to sit on the bottle for a bit while my wife and I got the ingredients together for a shrimp jambalaya that we had been planning for for a while. It was worth the wait. The wine was light in the glass and the aroma of tropical fruit was present, but very subtle. Crisp and refreshing, it took me a few minutes to put my finger on the flavor, but the green apple I got was very enjoyable, and a perfect pair to the slight mineral finish that the wine offered. Slightly effervescent, the wine as a whole was a great compliment to the slightly spicy dish of shrimp jambalaya, and would pair well with any well seasoned seafood. I can imagine this as a great compliment to a spicy peanut tilapia dish. At the end of the day, the real question on any of my reviews is would I drink this again, and in this case – absolutely. At $11 it’s a great value for a good white wine to pair with seafood, and I’d actually pair more for it. Definitely one worth grabbing for your next seafood dinner. Special thanks to Wine & Beer Westpark for supplying the wine for this review. Ok – Jongieux is a town within the Vin de Savoie AOC. 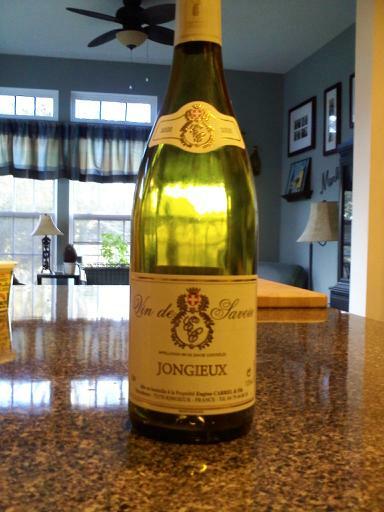 The grape for that AOC, and for white wines labeled “Jongieux” is Jacquere. I like your blog but you ought to make yourself drink some more reference wines to calibrate your palete bit – like some medium priced Burgundy (white and red) some good Bordeaux, some CNP, some Cote-Rotie, an expensive Priorat.